As we take a look back at KONP’s campaigning work in 2018 – alongside Health Campaigns Together and our allies – it is impressive and daunting to see just how much work has been required of us, how we have delivered with such positive impact, by so many brilliant campaigners. Here we look at the year with important themes and in a linked post we have 2018 – January to December roundup. We have done some great work with allies who share the commitment to defending health and social care as essential public services – People’s Assembly, the TUC, We Own It. KONP itself has great partners affiliated to us such as the NHS Support Federation, Doctors for the NHS, Socialist Health Association and the online ourNHS. we have built our social media and launched our new video series. And we have celebrated the essence of the NHS in thanks to our NHS staff and the essential services they still manage to provide under intense stress. 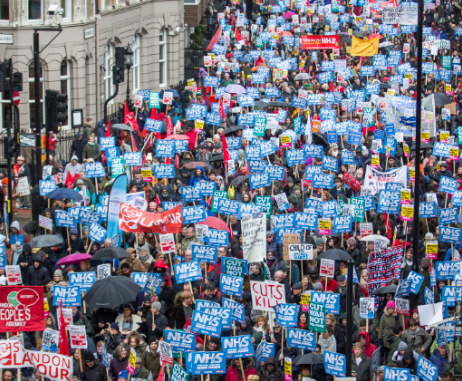 We need to step back from the pressures and worries that can be intimidating as we face the apparently unstoppable momentum of those powers that are moving against the public NHS – pause and look at what we have achieved. We have in some cases stopped the seemingly unstoppable, we have slowed down the pace or destruction, seen some barriers weakened or partially dismantled and we have given hope to many new campaigners joining our ranks. As we digest the NHS Long Term Plan and uncover the dangers behind the public spin used by NHS England and government, we can have confidence that KONP, Health Campaigns Together and our allies are up to this task. 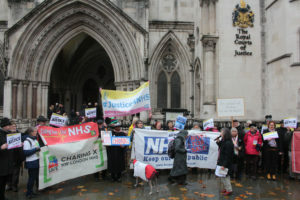 Though not new, some health-related issues came through very powerfully during 2018, including issues of institutional racism, mental health, partnership working between trade unionists, the TUC and campaigners, and it is worth looking at the epic legal challenge mounted through the year by the judicial review team (#JR4NHS) against NHS England and the government’s accountable care organisation (ACO) contract. Finally, the latest events around the NHS Reinstatement Bill is summarised. It became ever clearer during 2018 just how inseparable the themes of prejudice and vulnerability are from access to a safe and universally accessible health service. The impact racism and institutional racism have had and is having on so many people is profound. In April the Windrush scandal blew up and Home Secretary Amber Rudd had to resign having inherited the impact of Theresa May’s hostile environment since she was at the Home Office. In the NHS, one of many victims of this disgraceful set of policies, with institutional racism embedded in them, was Albert Thompson. In the same month, press exposure finally forced the government to concede that Mr Thompson would be entitled to cancer treatment after months of delay. ID checks on NHS patients and charging – checks on patients who are temporarily here, visitors for work or on holiday, undocumented migrants and undocumented anyone else whose appearance leads to an ID challenge – is now instituted NHS policy. In August North East London KONP groups and allies announced a campaign against the charging of patients who could not prove their NHS entitlement and against the overall hostile environment. Barts NHS Trust had been running a pilot with the Home Office. The trust board was highly embarrassed by the campaigners’ presence and the challenge to them in September. The trust made some concessions but NHSE policy continues, enshrined in law and is embedded in the NHS Long Term Plan of 7 January 2019. 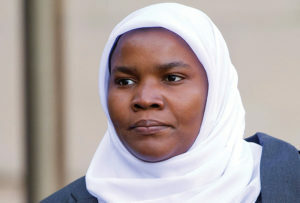 In August, a dramatic Appeal Court legal decision allowed the reinstatement of Dr Hadiza Bawa-Garba on the Medical Register. This overturned the High Court’s decision to endorse the GMC in striking her off – a drastic career-ending action disproportionately taken against BAME doctors. The case had been crowdfunded by individual doctors campaigning on Dr Bawa-Garba’s behalf. Her nightmare had lasted nearly three years. In December Lewisham Campaigners received information in response to their Freedom of Information (FOI) request from the local trust for numbers of pregnant women – there are approximately 9000 births per year at the trust – who have been charged for their NHS care and screened for their eligibility. For the 2017/18 financial year the number of ‘women [who] were charged for their maternity care’ was 541 and ‘a further 1100 women had their entitlement to free NHS care assessed and were deemed eligible for free NHS care’. This has shocked local campaigners and is clearly an important campaign issue for KONP to take up nationwide and with politicians. The importance and life-saving essence of safe and good mental health services have been highlighted this year – too often through tragedy. In February, Lewisham Mayor and Council responded very positively to the public testimony of children, parents and staff, to the three local MPs, a public statement from Jon Ashworth and diligent work of Lewisham campaigners in briefing councillors, the scrutiny panel and MPs on the dangers of cuts to child and adolescent mental health services (CAMHS). The Council reversed a previous decision to cut (CAMHS) by £150k. This welcome decision was a victory for Save Lewisham Hospital Campaign, local Unite members in CAMHS and Lewisham families. The core job of trade unions is to defend their members’ quality of life, terms and conditions and level of pay. But through these years of austerity dramatically affecting work conditions and pay, increasingly attacks on public services undermine their members’ families’ health, social care and education. Unions and campaigners have increasingly come together. Some 9 national unions are now affiliated to Health Campaigns Together. 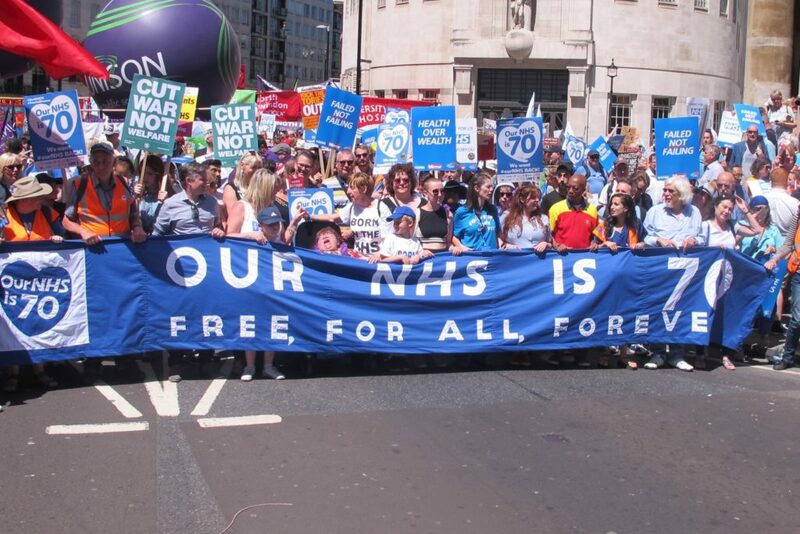 The jointly organised demonstration for the NHS’ 70th Birthday #NHS70 by HCT, the TUC, KONP and People’s Assembly on 30 June was a memorable event. Before and after that week, actions of unions supported by campaigners had met with significant success (eg see reports in HCT July issue, pp2-3). 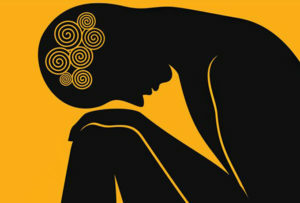 Following the birthday demonstration 30 June, HCT and KONP met with the TUC and with People’s Assembly in August agreeing to ongoing joint work – in including the subco issue (wholly owned subsidiary companies) and mental health (see above). The legal and political battle of the year on the NHS has surely been the #JR4NHS battle fought by campaigners against Accountable Care Organisations and the contract that threatens to open the financial and general management of the entire NHS structure to competitive tender. Several other JRs have taken place, including 999’s #Justice4NHS judicial review challenging the cost-capping funding method of the ACO contract. January also saw an early victory through the judicial review challenge to the legality of NHS England’s Accountable Care Contract (ACO) mounted by our ‘Famous Five’ (Allyson Pollock, Sue Richards, Colin Hutchinson – all three members of KONP – and Graham Winyard, joined by Professor Stephen Hawking) won early victories, not in court but through the threat of legal scrutiny. The government and NHS England had to accept that they had to hold a national public consultation on ACOs, and that no ACO contract will be signed until that had happened. First blood to our team. Jeremy Hunt had fully intended to have the first ACOs up and running from 1 April by enabling his ACO contract through secondary regulations, bypassing parliamentary and public scrutiny. This was followed in February by another victory when the attempt by the Department of Health and NHS England to demand punitive and uncapped costs, should our claimants lose the JR, was judged not to be in the public interest. At the end of February, three of the ACO JR team and KONP co-chair Dr Tony O’Sullivan appeared in front of the Health and Social Care Select Committee chaired by Dr Sarah Wollaston MP. It was a fractious encounter, in which some key points our panel made were ridiculed by certain committee members, only for the committee to put our points as questions to future panels and Simon Stevens: for example, they tried to ridicule Allyson Pollock’s insistence that primary legal change was needed or NHSE and government intentions to push through the ACO contract as it was then would be illegal. Later the committee asked Simon Stevens what primary legal changes to the 2012 Health & Social Care Act he would ask for to facilitate his policies. 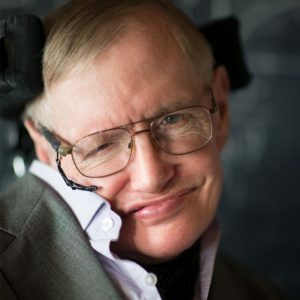 Very sadly, the JR team and the NHS soon lost their powerful ally Professor Stephen Hawking who died in the early hours of 14 March. The team went ahead with the ACO JR at the High Court hearing 23/24 May. KONP was outside the Royal Courts and inside the court room in force to show our support. In July, Judge Justice Green published his findings in favour of the Government and NHSE but his ruling made clear that the challenge had been in the public interest. He rejected the punitive costs claim from the defence and protected the team from 35% of costs. He could rule the ACO (now known as ‘integrated care provider’ – ICP) contract to be illegal when, under pressure, the government had conceded there had to be a public consultation, with the implicit possibility that the contract would be altered. We remember that a public consultation on the ACO (ICP) contract had only been conceded by government because it knew it would leave itself open to the contract being declared illegal without such consultation. Campaigners had forced concessions, embarrassed the government and NHSE into changing terminology from ACO to ‘integrated care provider’, had altered the whole terms of debate and had materially defended the NHS. The 999 JR challenge to ACOs from a different angle won the right to appeal against a cursory hearing and a rapid dismissal at a Leeds High Court hearing in April. 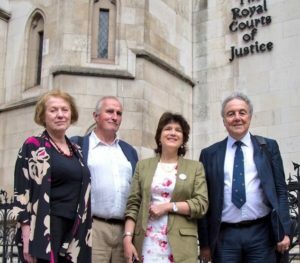 London KONP supported the appeal at the High Court 20 November. In December the Appeal judges subsequently upheld the government and NHSE position on ACOs and the across-the-piece cost-capped budget allocation. 999 is considering an appeal to the Supreme Court in 2019. 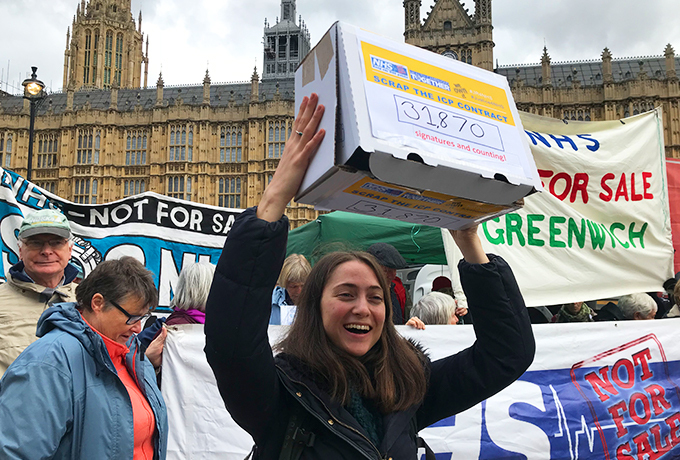 Eleanor Smith Labour MP for Wolverhampton became the third MP, following Caroline Lucas 2015/16 and Margaret Greenwood 2017, to sponsor this totemic piece of draft legislation which embodies the legal principles to win back the NHS. The four-year campaign to keep the NHS Reinstatement Bill on the parliamentary timetable reached an important milestone in July with a discussion between the Shadow Front Bench Labour team, including Jon Ashworth (Shadow Secretary of State for Health), Eleanor Smith MP, the authors of the bill, Allyson Pollock and Peter Roderick, and leading campaigners from KONP, Health Campaigns Together and the Socialist Health Association. The outcome was a public statement from Jon Ashworth and a commitment from the Labour Party to work with Eleanor Smith and the NHS Bill authors to agree a text for her private members’ bill; and for the LP to prepare primary legislation, in collaboration with Allyson Pollock and Peter Roderick and people and organisations at the meeting, in readiness for putting forward in a new parliament. Eleanor Smith presented the long title of her 10 Minute Rule private members’ bill in parliament on 13 July. It was tabled on the agenda for the second reading 26 October but no time allocation was given. 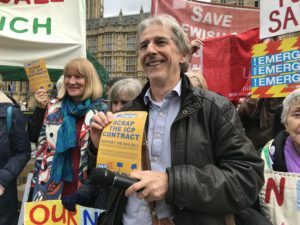 We organised a rally outside Parliament on the day to mark the Bill’s appearance and to accompany the handing in of the 34,000-signature petition against the ICP contract to the Department of Health. It remains part of this parliamentary session’s business until a new election or until this summer. Jon Ashworth has written for the HCT newspaper and given conference and other public speeches committing to ending privatisation, restoring the NHS to a publicly funded and provided service and bringing back the tradition of Aneurin Bevan. As we enter 2019 that is the vision we need to hold to and fight for. The NHS will not be won back without courage and steadfast unity across health campaigners and political allies. Best wishes to all campaigners and NHS staff after a very full and successful year of campaigning in 2018. 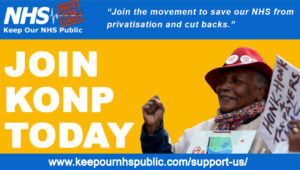 Join Keep Our NHS Public today! Magnificent account of the work that KONP and its officers and staff have done during the NHS 70th birthday year and I hope all members and the press take note of this. As we enter the uncharted waters of the Brexit debacle and are faced with yet another NHSE attempt tore-organise the NHS with Sion Stevens 10 year plan full of wishful thinking and ideas that cannot work without more money I can see another year of bard campaigning ahead us. I particularly liked the 500,000 deaths that were going tobesaved Ithink he means prevented prematurely as onewthigis certain we all end up saying! Hi there would y᧐u mind stɑtіng which blog ρlatform yоu’гe using? a difficult time selecting between BlogEngine/Wordpгess/B2evolution and Drupal. and I’m looking foor sopmething comρletely uniquｅ.